What is the natural state of the mind? It seems like the nature of the mind is to wander from one thought to the next! The mind ossillates between thoughts from the past or the future, bringing with immense stress due to regrets from the past or anxiety about what the future is going to be!! Man is born a blissful being, but loses this state rapidly due to various external factors that condition the mind and disrupt this true nature. Bliss is the true nature of every being. Enjoying the present moment to the fullest is our birth right. There is an unconscious constant yearning to connect to this source of bliss that is hidden deep within us. Layers of mental patterns and emotional disturbances act as barriers when we try to reach this ocean of bliss. Connection to the ocean of bliss enables us enjoy immense creativity, energy, and intelligence available within each one of us. We only need to present the opportunity to connect to our source of bliss and move inwards towards it. The step by step process in this Meditation process removes an obstacle which then naturally allows the bliss energy to gush forth helping us relax and rejuvenate the body and mind. Presenting an opportunity to move inwards towards our true nature is the first step in realizing and experiencing the ocean of joy within us. A glimpse of this bliss can only help you move deeper and deeper helping you establish in it forever. It’s just like diving—all we need to do is take the correct angle, and gravity does the rest. In this part of the meditation, (which is the most dynamic aspect of the five part process), we address the mind directly and swiftly through the breath; chaotic breath. We shake the habituated patterns of the mind by breathing chaotically; chaotic meaning there is no set rhythm or pattern in the breath. Sitting Position: For this part of the meditation, we sit in the yogic position vajrasana (sitting on your heels with knees and feet together). This position helps with the energy flow in the system. We place our hands on our hips to connect the upper and lower body, close our eyes and breath chaotically in and out of the nostrils. The second instruction is to hum as loudly, as deeply and as intensely as possible and to keep the whole awareness with the humming sound. The instruction is you are meant to just ‘become the humming’.The mind becomes beautifully integrated and still by continuously having the awareness on the humming sound. Pratyahara (withdrawing from the senses) contines to deepen and dharana (one pointed awareness) starts to happen through the process of intense humming. Sitting position: For this part of the meditation, we continue to sit in the vajrasana position, we form chin mudra (joining tip of thumb and index finger together) and hum intensely with our eyes still closed. After intense humming, we go even a little deeper and a little more subtle. Dharana (one pointed awareness) is experienced in this aspect of the meditation as the practitioner is asked to bring their awareness to each of the seven major energy centres (chakras) in the system, one at a time.The purpose of chakra awareness is to practice one pointed awareness and move deeper into dhyana (meditation or deep restful awareness). 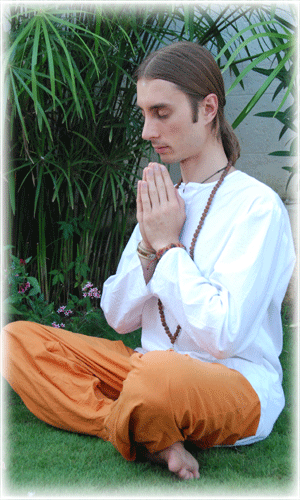 Sitting Instruction: We can move out of vajrasana and sit cross legged (sukhasana). Hands can be relaxed in your lap. The next instruction is just to be ‘un-clutched’. Un-clutching means simply sitting and observing your thoughts as they raise one by one. It means just seeing the thoughts as they are; unconnected, independent, illogical and un-clutched. Click here to start meditating using the guided audio for the Nithya Dhyaan meditation.